Just finished setting up my Ken Wel display in my study. 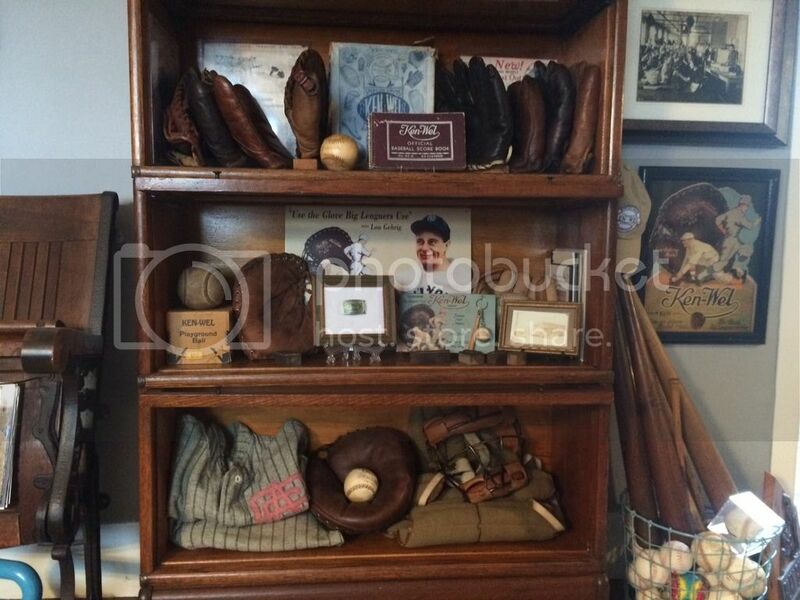 Besides a few gloves, I have a glove box, score books, belt buckle, advertisement items, balls, bats, a few printing blocks used on catalogs, and a photo of the interior of the factory which is hanging above the die cut advertisement. I fixed the image link so that all can see. looks awesome!! Need to post mine on here sometime...By the way, I will give you $5 for the killer folding chair on the left!!! Great display - thanks for sharing! Glovester: The chairs are from a local theater that closed down some years ago. Not exactly ballpark chairs, but some what resemble box seats and fit in well with the cabinet and complete the look of the wall. I like the bars under the seats that allow me to display photos and yearbooks when the seat bottoms are in the up position.